I'm standing two feet off the ground with my hand on my husbands shoulder gripping on hard as my feet begin to shake from side to side. "Relax, let go and just keep your focus on the goal and you will be fine," he says. I am constantly amazed at how good Father is to me! He seems to bring just the right people and experiences at just the right time to encourage, convict and inspire me along this journey! I have really been struggling lately with the fact that this year has been a VERY relaxed year for us! Throwing a little guy into the mix and trying to teach him has not been as easy as I had imagined it! I am a very structured person and Father knew that I needed to give this area over to him and learn once again to let go and trust! My "teaching" has been little and slow this year but the learning has been great! "relax, let go and just keep your focus on the goal and you will be fine!" So true, and by the way, I love your skirt. I love the skirt too. And wow, uh, you are walking on a line off the ground. :) I might try that some time. One of our favorite books is Mirette on the High Wire. Have you read it? What a sweet hubby! I love this post! You are doing great! Your kids are amazing kids! I enjoyed hanging out today and catching up! Thanks for having us over! 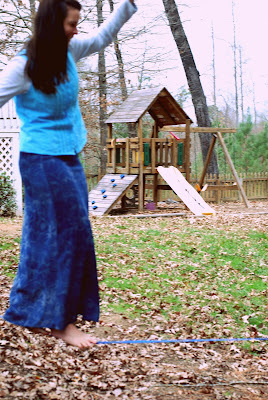 Love the skirt as well.. :) Slacklining looks like a fun family challenge, I may have to go look into it. An extremely beautiful post. We too "relaxed" this year and this mom is learning to trust in Him like never before.